7:15am Officers investigated a report of a motorist driving recklessly in the 1600 block of Marion Rd. 8:40am A man was given a verbal warning reference trespassing on railroad property off of the Clinton St. area. 9:46am Officers investigated a report of a motorist driving over the speed limit in the W. Irving, Monnett St. area. 11:51am Officers investigated a one car injury accident on S. Walnut at Rensselaer St.
12:48pm Officers investigated a private property accident in the 500 block of S. Sandusky Ave.
1:19pm A 25yr old Bucyrus man was issued a citation for illegal burning in the 1000 block of Tiffin St.
1:23pm A false alarm was received in the 300 block of W. Oakwood St.
2:07pm Officers assisted a motorist with a vehicle lockout at CVS. 3:41pm Jacob Morton, 21, was arrested on charges of Criminal Trespass. He was issued a summons to appear in court and released. 4:37pm A three vehicle accident in the 300 block of S. Sandusky Avenue was investigated. 4:41pm A Bucyrus resident reported being assaulted by someone she knows while at Harmon Field. 4:49pm A Bucyrus resident reported receiving harassing messages over Facebook from someone she knows. 5:11pm Officers spoke to a resident in the 500 block of S. East Street about an unruly juvenile at the residence. 5:31pm Two subjects were warned for Soliciting Without a Permit in the 800 block of W. Mary Street. 5:57pm A report of a possible drunk driver on N. Sandusky Avenue was investigated. The vehicle was located parked and unoccupied. 7:10pm A false alarm in the 1200 block of N. Sandusky Avenue was investigated. 7:18pm A verbal traffic warning was issued in the 1600 block of Marion Road. 7:19pm A bicycle found in the 500 block of Myers Street was returned to the original owner in the 900 block of Hull Avenue. 8:30pm A bicycle found in an alley off the 400 block of W. Warren Street was brought to the Police Department. 8:53pm A resident in the 400 block of W. Mansfield Street reported his residence entered. 10:02pm A customer at Walmart reported her vehicle vandalized while parked at the business tonight. 10:45pm A report of dogs barking in the 1200 block of N. Sandusky Ave. was investigated. 11:16pm A report of loud music at Heritage Circle was investigated. 11:23pm Adrian Gallegos, 23, was arrested for domestic violence. He was taken to the Crawford County Justice Center to await an appearance in court. 11:23pm Officers served 7 city income tax summonses on station. 11:56pm A report of vandalism in the 1200 block of Monnett St. was investigated. 12:04am A report of a male assaulting a female in the area of E. Irving St. and Wingert St. was investigated. 12:07am Officers mediated a domestic issue in the 100 block of Wayne Ave.
1:02pm A false alarm in the 1600 block of Marion Rd. was investigated. 1:26am Zachary Aidt, 22, was arrested on a warrant out of Wyandot County. He was turned over to a deputy from Wyandot County. 1:48am A verbal traffic warning was given in the area of Tiffin St. and Schaber Ave.
2:12am A verbal traffic warning was given in the area of Hill St. and Tiffin St.
2:17am A report of a suspicious vehicle in the 800 block of High St. was investigated. It was found to be a mother picking up her children. 2:22am Officers responded to a report of 3 fights going on inside the Crazy Fox. All parties involved were sent their separate ways. 3:16am Officers spoke to a male who claimed to have been assaulted while at the Crazy Fox. 4:25am A report of a pick-up truck with a bed full of people driving in the area of Whetstone St. and Hopley Ave. was investigated. 4:56am Officers on patrol investigated a suspicious vehicle parked at Lions Field. 5:19am A verbal traffic warning was given in the area of N. Sandusky Ave.
5:32am A report of a suspicious male in the 800 block of E. Warren St. was investigated. 6:40am A verbal traffic warning was given in the area of E. Warren St. and Wiley St.
10:39am A theft report was made in the 900 block of S. East St.
10:42am A traffic citation was issued in the 600 block of N. Sandusky Av. 10:44am A private property accident was investigated in the 1700 block of Marion Rd. 10:50am A theft report was taken in the 1500 block of N. Sandusky Av. 10:59am Officers spoke to a person on station about a civil issue. 11:07am A purse was reported stolen in the 200 block of E. Mary St. The purse was located by the owner a short time later. 11:07am An accident report was taken in the 100 block of E. Galen St.
1:21pm Jessica Robson, 26, was arrested in the 600 block of E. Lucas on charges of theft. She was issued a summons to appear in court and released. 1:24pm William Hoffman, 42, was arrested in the area of Lane and Water St. on charges of Possession of Drug abuse instruments and drug paraphernalia. He was issued a summons to appear in court and released. 2:10pm Officers assisted Crawford County Sheriffs Deputies. 4:10pm Officers assisted with a traffic concern in the 1200 block of E. Mansfield St.
4:19pm Natalee Mcintyre, 20, Clary Willis, 25, Ronald Pavlus, 27, were all arrested following a traffic stop for various charges including possession of drugs and possession of heroin. Mcintyre and Pavlus were taken to CCJC to be held for court. 5:14pm A 9-1-1 hang up call was investigated in the 300 block of N. Sandusky Avenue. No one was located needing assistance. 6:09pm Officers recovered a syringe found in the 500 block of N. Sandusky Avenue. 7:19pm A disturbance at Dollar General was investigated. Two subjects were trespassed from the business. 7:44pm Officers assisted a motorist locked out of his vehicle at Heartland of Bucyrus. 7:55pm Two juveniles found around a vacant residence were warned about trespassing on private property. 8:08pm A traffic citation was issued in the area of Schaber and Tiffin Street. 8:08pm A verbal warning for trespassing was issued in the 600 block of Earl Street. 8:30pm A verbal traffic warning was issued in the 200 block of W. Mansfield Street. 8:58pm A Bucyrus resident reported vehicles speeding in the area of Woodlawn and Union Street. 9:02pm A parking complaint in the 400 block of Heritage Circle was investigated. 9:31pm A verbal traffic warning was issued in the 900 block of Tiffin Street. 9:54pm A verbal traffic warning was issued in the 100 block of S. Lane Street. 9:58pm A verbal traffic warning was issued in the 100 block of Plymouth Street. 10:02pm A 9-1-1 hang up call was investigated in the 500 block of E. Mansfield Street. No one was located needing assistance. 10:12pm A written traffic warning was issued in the 1100 block of W. Mansfield Street. 10:25pm A 9-1-1 hang up call was investigated in the 300 block of Kearsley Street. The subjects had already transported someone to the ER when officers arrived in the area. 10:51pm A report of kids in the area of Woodlawn and Prospect Street possibly with smoke bombs was investigated. 11:32pm Officers assisted EMS personnel in the 200 block of E. Irving Street. 11:36pm A verbal traffic warning was issued in the area of Perry and Walnut Street. 11:49pm A verbal traffic warning was issued in the area of Mansfield and Fisher Street. 12:01am A verbal traffic warning was issued in the area of Fair and Highland Avenue. 12:29am A verbal traffic warning was issued in the area of Whetstone and Cullen Avenue. 12:36am A verbal traffic warning was issued in the area of Tiffin and Pleasant Hill Drive. 12:45am A report of someone going through the cars at TJS Auto Sales was investigated. No one was located in the area and the vehicles were all secure. 1:50am Officers were out with a subject on Washington Square. 2:07am Miranda Bloomfield, 36, was arrested on a Crawford County warrant. She was issued a date to appear in court and released. 2:18am Officers checked on a suspicious vehicle in the 1000 block of Nevada Road. 2:52am A report of someone stealing a sign from the yard at Hymiler was investigated. The sign was located and returned to the business. 3:03am Officers were out with a suspicious male in the 200 block of Hopley Avenue. 3:58am A report of a barking dog in the 1000 block of Elm Street was investigated. 6:39am A false alarm in the 500 block of S. East Street was investigated. 10:42am A W. Galen St. resident reported their residence entered, money and prescription medication was reported missing. 12:51pm Officers assisted a motorist locked out of their vehicle in the 500 block of W. Charles St.
12:52pm A report of a child abuse was taken and is being investigated. 1:02pm Officers investigated the report of a suspicious vehicle in the Heritage Circle area. 1:16pm Officers assisted Life Support Ambulance personnel in the 100 block of Plymouth St.
1:34pm Officers assisted a motorist locked out of their vehicle in the 500 block of Wilbur St.
1:59pm Officers assisted a motorist locked out of their vehicle in the 500 block of S. Spring St.
2:16pm Officers assisted with an unruly juvenile at Bucyrus Plaza. 2:28pm Officers spoke to a person at the Police Department about a domestic issue. 3:17pm A report of a dog left in a vehicle at Walmart was investigated. 3:40pm Daniel Rosas, 18, was arrested in the 500 block of Prospect St. on charges of possession of marijuana. He was issued a minor misdemeanor citation. 4:26pm A verbal traffic warning was issued on Marion Rd. 5:22pm Officers assisted a motorist locked out of the vehicle at Lions Park. 6:42pm Officers checked the welfare of a person in the 1000 block of Nevada Rd. 7:58pm Officers assisted with a standby in the 800 block of N. Sandusky Av. 8:47pm A disturbance in the 300 block of S. Spring St. was investigated. 8:49pm Officers checked the area of Earl and Irving St for a traffic complaint. 9:02pm A verbal traffic warning was issued in the 200 block of S. Lane St.
9:02pm A report of people trespassing in the 100 block of W. Liberty St. was investigated. They people had permission to be at the residence. 9:25pm Officers spoke to a group of juveniles about jay walking. 9:52pm A report of suspicious activity in the parking lot at Walmart was investigated. 9:54pm A resident in the 300 block of W. Lucas Street reported someone cutting his pool with a knife. 9:58pm A report of kids shooting off bottle rockets on Monnett Street was investigated. 10:06pm A report of kids playing in the roadway on Plymouth Street was investigated. 10:41pm A verbal warning was issued for loud music in the 500 block of Plymouth Street. 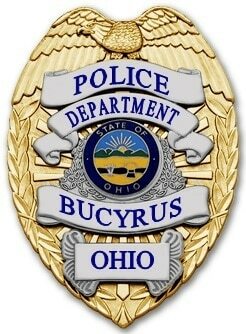 10:56pm A report of fireworks in the area of Bucyrus Estates was investigated. 12:21am A report of a bow and arrow set on the grass outside the Bucyrus Community Hospital was investigated. 12:23am A report of prowlers around an empty house on W. Liberty Street was investigated. 1:04am A 17 year old Bucyrus boy was arrested on charges of Curfew violation. He was released to a parent pending a court date through juvenile court. 1:27am A report of two suspicious males loitering in the 900 block of S. East Street was investigated. 2:32am A verbal traffic warning was issued in the 600 block of E. Mary Street. 4:51am A false alarm at Transco was investigated. 6:21am A false alarm at Carle’s Bratwurst was investigated. 6:23am A suspicious vehicle at Aumiller Park was investigated. 6:40am A traffic citation for Driving Under Suspension was issued in the area of Charles and East Street. 7:09am A false alarm in 900 block of Hopley Ave. was investigated. 7:24am Officers investigated a report of vandalism to a vehicle in the 200 block of W. Mary St.
7:40am A report of a subject driving recklessly on Marion Rd was investigated. 8:09am Officers picked up drug paraphernalia in the 200 block of Crossroads Blvd. 10:25am Officers investigated a report of vandalism to a vehicle in the 400 block of S. Poplar St.
10:26am A welfare check was done on in the 1100 block of S. Walnut St.
11:17am Officers assisted a motorist with a vehicle lockout in the 100 block of W. Liberty St.
11:49am Officers investigated a report of a disturbance in the 500 block of E. Charles St.
12:56pm Two subjects were arrested for possession of marijuana after officers responded to a disturbance in the Sandusky/Mary St. area. 1:00pm A motorist was given a verbal warning for manner of driving in the 100 block of Iron St.
1:42pm A report of a small child outside alone in the 200 block of W. Charles St. was unfounded. 2:08pm Officers investigated a report of a disturbance in the 300 block of E. Rensselaer St.
2:57pm A report of a man trespassing in the 1000 block of Lavina was investigated. 4:04pm A false alarm in the 700 block of S. Poplar St. was investigated. 4:10pm Officers mediated a domestic disturbance in the 1000 block of E. Beal Av. 4:59pm A report of a disturbance was investigated at Aumiller Park. 5:24pm A verbal traffic warning was issued in the 500 block of S. East St.
5:56pm A report of children playing in the street on Prospect St. was investigated. 7:3pm A false alarm was investigated at the Bucyrus Secondary School. 7:46pm Officers assisted a motorist locked out of their vehicle at Kroger. 8:48pm James D. Wills, 30, was arrested for Possession of Drugs and served with a city income tax summons. He was taken to the Crawford County Justice Center to be held for a court appearance. 10:29pm Officers assisted a Songer Ave. resident with an unruly juvenile. 11:03pm A false alarm at IB Tech was investigated. 11:53pm A report of fireworks being set off in the 400 block of Milo St. was investigated. 12:31am A disturbance between motorists at Outhwaite Reservoir was investigated. 12:49am Officers investigated a suspicious vehicle at Outhwaite Reservoir. 12:52am Officers on patrol investigated a suspicious vehicle at the Friendship Bridge. 12:59am A male was cited for driving under suspension in the 400 block of N. Sandusky Ave.
1:18am A verbal traffic warning was given in the area of S. Spring St. and W. Oakwood Ave.
2:15am A false alarm in the 1300 block of E. Mansfield St. was investigated. 2:58am Officers assisted an intoxicated male in the 200 block of S. Spring St. He was left in the care of his mother for the night. 3:22am A report of an open door in the 200 block of E. Beal Ave. was investigated. 3:33am A disturbance in the 600 block of E. Rensselaer St. was investigated. 4:17am A resident in the 1200 block of Monnett St. reported someone trying to enter a window on her home. Officers checked around the house and found it to be secure. 5:28am A verbal traffic warning was given in the 500 block of E. Rensselaer St.